Amish Quilt 9 oz. All Natural Vegan Soy Cotton or Crackling Wooden Wick Candle by ATHDecor. Dye Free. This listing is for one (1) 9 ounce All Natural Soy Hand Poured Dye Free Candle scented with our Amish Quilt Fragrance oil. Choose between a Crackling Wooden Wick -or- a 100% Cotton Braided Wick. 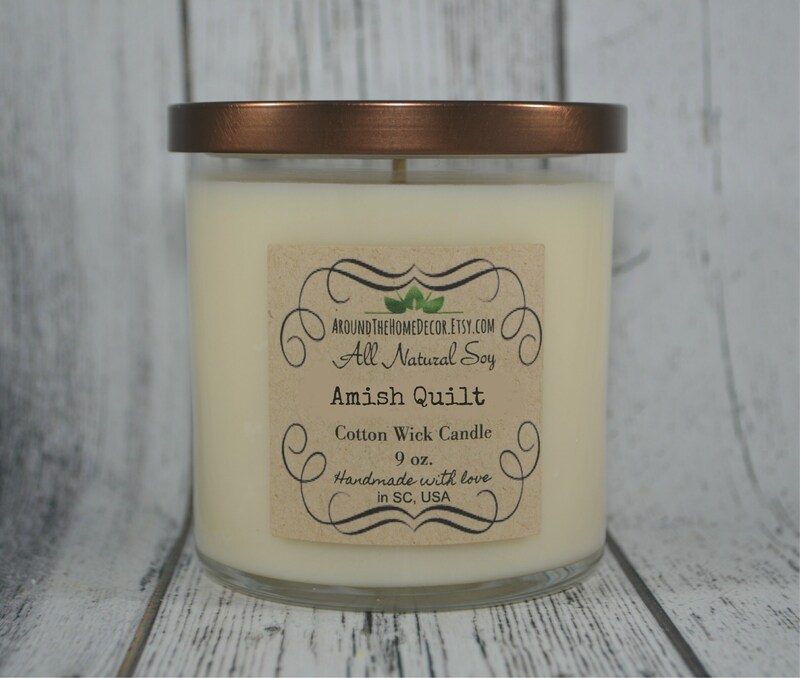 Amish Quilt: A warm spicy fragrance with sweet vanilla hay notes and a baking peach pie character. The perfect size for gifting or just anytime! Price includes Gift Box. Peppermint 9 oz. All Natural Vegan Soy Cotton or Crackling Wooden Wick Candle by ATHDecor. Dye Free.